An earthquake fault runs through the famous shopping district on Rodeo Drive in Beverly Hills, California, new data indicate. According to the California Geological Survey, the Santa Monica fault zone goes straight between Santa Monica and Wilshire boulevards in the Los Angeles-area city. Buildings and structures directly atop fault lines are especially susceptible to damage in earthquakes, sometimes having their foundations literally split apart. The final map released earlier this month illustrates the risk of earthquakes in an area of high-end shopping. 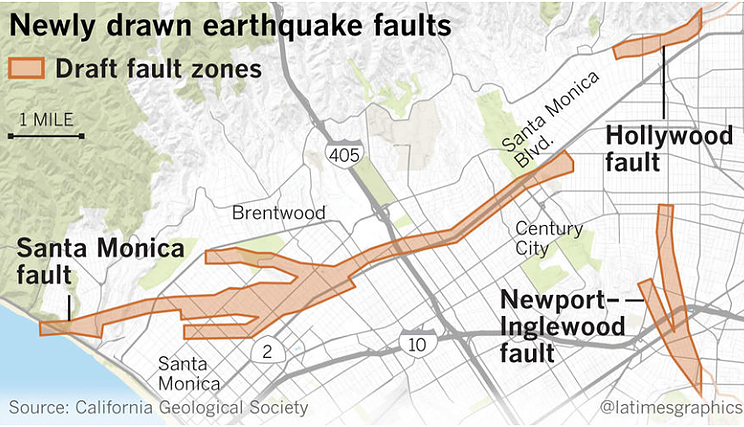 The fault line could one day yield a magnitude-7 earthquake in Los Angeles County, the most populated county in the United States. It's been anywhere from 1,000 to 3,000 years since the last major earthquake occurred on the Santa Monica fault, experts said.